Sited on the banks of River Burhi Gandak, Muzaffarpur is the largest city of Bihar. Because of the world renowned quality of Shai Lychee and Chinese Lychee, the city is also called the Lychee Capital of India. It is the amazing quality of this fruit which gave a chance to Muzaffarpur to win several international honors. 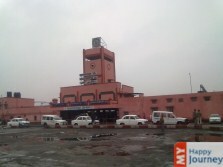 Thus, it is also a popular trade center of India. Named after a revenue officer of the early eighth century, Mazaffar Khan, it has now become a marketing center for the northern Bihar region. This city is the perfect combination of traditional and modern. On one side there is Motijheel, a commercial hub, while on the other hand the city also has a long list of ancient temples to visit. Some of these are Kali Temple of Sikandarpur, Chaturbhuj Temple, Shri Ram Temple, and Baba Garib Stan, the holy place devoted to Lord Shiva. Besides the temple, you can also visit the Kesaria Stupa, which is one of the largest monuments of India. Khudi Ram Bose Memorial and Rama Chandra Shahi Museum are also must visit places. Muzaffarpur also gives you a chance to visit places of significance for Buddhists. Sited a few kilometers from the city, Rajgir and Vaishali are two important places in this regard. You can also make a visit to nearby location Nalanda, which proudly flaunts its miscellany of stupas, temples and the world renowned Nalanda University, and the exhumed artifacts of this place are exhibited in the Nalanda Museum.